Circe is yet another client for IRC in Emacs. It provides most features one would expect from an IRC client, with sane defaults to start from. The best feature of Circe is the activity tracker, which many will know from ERC. That tracker displays (abbreviations of) channels with activity in the mode line, highlighting entries when your nick is mentioned while you're not looking. It is easy to check on talk while working, as C-c C-SPC will cycle through all channels with activity, returning you to your work when no more Circe buffers with activity are left—everything well integrated into your normal work environment. About half of Circe is a separate library, called Lui, which handles all of the user interface for Circe. It is designed to be usable for other software projects. Please refer to the source file for more information. 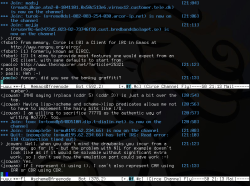 Circe was originally written because the author felt ERC, another very nice IRC client for Emacs, had become more and more difficult to debug and improve. The alternative, rcirc, lacked many features the author wanted. So the solution was to write a new client. Circe owes a lot to the great ideas that got incorporated into ERC, and to the long amount of experience gotten from that project. "Authenticate to a bitlbee server." (format "PRIVMSG #bitlbee :identify %s"
There's a mailing list for circe. You can subscribe via the web interface. This page was written in GNU Emacs. The fontified Emacs Lisp code was generated by htmlize. The screenshot was created using The Gimp. No humans were harmed in the creation of this page. The project, webpage and mailinglist is hosted on Savannah—many thanks to GNU for providing this great service! 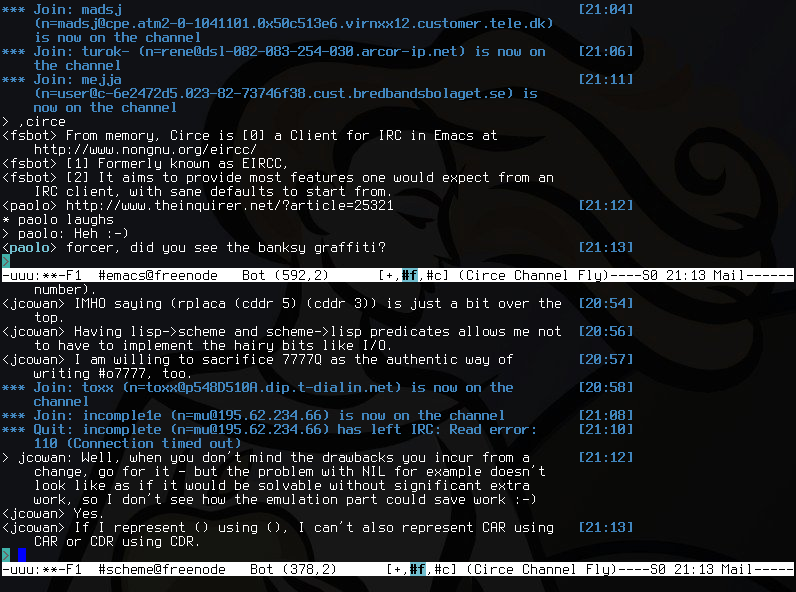 There's another IRC client named Circe, written in Python. That client is totally unrelated to this one. The channel #circe on Freenode is related to that client. If you have questions about Circe for Emacs, visit #emacs.